The wife and I transferred from Oak Grove to Blue Angel park over the July 4th week. 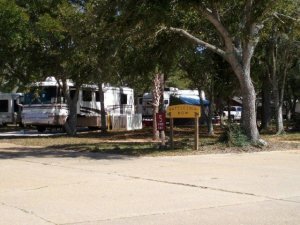 Was very surprised that the campground had a opening. We stayed at spot 9 at Anchor Cove. Camp host - We can't comment because we didn't meet him even though he was directly across from us. We saw him several times but never said anything to us. Mike (at the front gate) was very nice and helpful. He is the one that signs you in and assigns your spot. Location - Great for us. Away from the crowded touristy spots. Was a short 20-30 drive to Pensacola Beach (where the rest of my family was staying in a beach house). The park is off the beaten path but we liked that. Short 5-10 min drive to local grocery store or local restaurants. We were in campsite #9 at Anchor Cove. Cleanliness/Hospitality - The park was very clean. The bath house at Anchor Cove was nice but your typical military bath house. Showers and floors were cleaned daily but the walls and ceilings look like they hadn't been wiped down for months. The campsites and general paths were clean. Larger 40' rigs would have a tough time getting through some of the paths to some campsites. Battleship Row has much more space for larger rigs. Amenities/Facilities - The bath houses at Battleship Row are much nicer and have laundry facilities. The "beach" is at Anchor Cove and is small but rarely crowded. The water is brackish, shallow, and warm. It was perfect for us to relax in with the kids. But we did make several trips to Pensacola Beach to get waves. There is a large concrete pad near Battleship Row for trailer and boat storage. The campsites at Anchor Cove are sandy and dirt but fairly level. No sewer connect at Anchor Cove but that didn't bother us too much. There is a putt putt course but needs a little TLC and a disc golf course (we didn't do either but looked fun, our kids didn't want to play). No Wifi but we were there for vacation so it didn't bother us. There is any abundance of shade and trees through Anchor Cove. Value - Great. $15/nt over a holiday week during the summer. Can't beat that. Overall - We will definitely be back. Our only dilemma is whether we stay at Anchor Cove or try out Battleship Row.